Okay I have been talking about them since Christmas but I have finally gotten enough sets completed and ready to sell that I can tell you all (all 3 of you) about it! 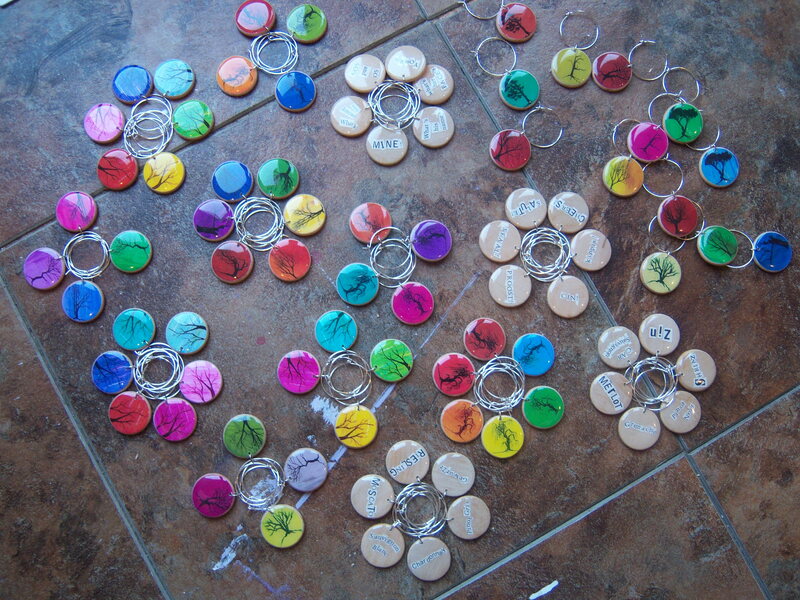 I am now making wine tags!.. 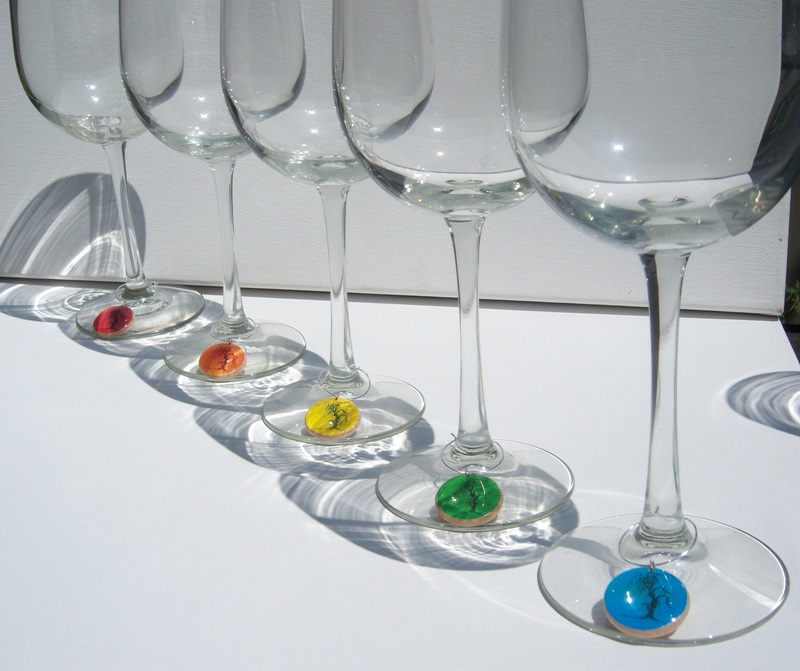 wine charms?… glass markers?… what would you call them? Well whatever you would call them, I am making them! Right now we have a few different sets. But there are more to come! Sets of various trees. Sets of one tree done in different colors. Sets of words done in a ransom-note cut-out-letters style. Pre-packaged sets of 4 or 6 or pick and choose your own! When my friends and I get together with a few bottles of wine there are extra special nicknames and catch phrases that eventually come out. And actually this is how these little guys came about. Whenever there was glass confusion one of my friends used to try to identify her glass based on the chapstick lip marks left on the glass…. not really a reliable source. 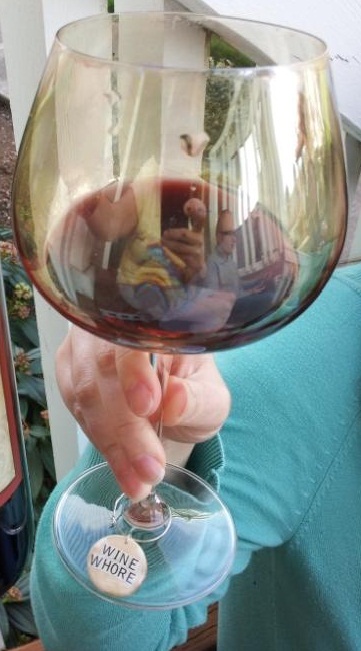 While I do not fear my friends have any major diseases or anything, my wine is MY WINE. So we needed a better method. We have so many fun drinking phrases it really lent itself well to this idea. And thus was born the very fist experimental set of wine tags. We have used them a few times and all went well. Also, drinking with a close group of friends results in A LOT of great new ideas (as well as a few equally fun but maybe not so marketable ideas). The words lead to more words, which lead to trying to include my paintings, and that lead to me playing with colors more on my painting prints, and that lead me here. With a whole bunch of these guys ready for your drinking enjoyment! The next obvious step for the wine tags includes you, my lovely customers! I made the first set just for our circle of friends and most people outside of that group would have no clue why you would want your wine glass to say anything about birdshit, but we get it. we also have a wine whore in our group… or two. So what do you want your tags to say? Ware your inside jokes? What are your nicknames? Who do you typically drink with and want to keep from stealing your glass? Initials? Wedding party in need of some fun specialized favors? Got a favorite of my paintings you want in your favorite colors? What do YOU want on your set? I can make it happen! Just contact me and we can work out the details. If you aren’t looking for your own set, but have some ideas for me anyways, fire away! New ideas and suggestions are always welcome. Wine charms have hit the shop! Check em out here!